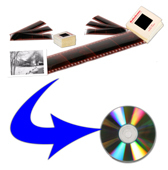 We will turn your film or slides into digital media on either CD or DVD so that you can view them on DVD player or computer. Digital files are also great for editing or just to make additional photographic copies with ease. If you need more extensive restoration, contact us to see what we can do to restore your old photographs or negatives. Of course we also offer competitive prices for scanning shoeboxes of photographs and smaller quantities of photographs.